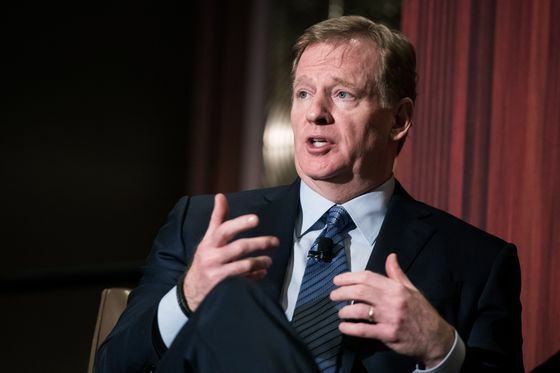 (Bloomberg) -- The National Football League’s Sunday Ticket package of out-of-town games may have finally outgrown its quarter-century exclusive with AT&T Inc.’s DirecTV, at least that’s what Commissioner Roger Goodell says as he looks to expand into the digital frontier. The NFL is the biggest TV ratings game in town and a huge advertising draw for the networks that carry it. Sunday Ticket is just one of eight different packages the league has going at the moment, and there seems no end to the number of ways the NFL can slice its TV rights. The league already has a nonexclusive streaming deal with Verizon that is specific to mobile devices and computers. It also has a Thursday night streaming deal with Amazon.com Inc.